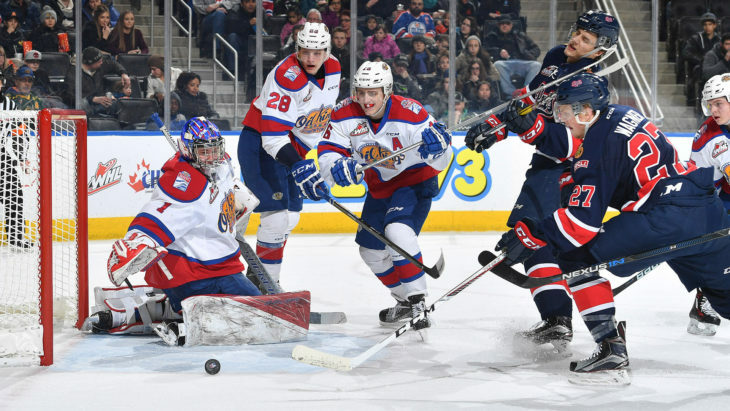 EDMONTON - The Regina Pats won a 10th straight game and clinched a spot in the 2017 playoffs on Friday night with a 5-2 victory in Edmonton over the Oil Kings. The Pats led 2-1 after the first, 3-2 after the second and added two more in the third period to sweep the Oil Kings in the four game season series. Wyatt Sloboshan, Connor Hobbs and Filip Ahl each had two points to lead the Regina offence. The Pats outshot the Oil Kings 39-27, the powerplay was one for two and the penalty kill went four for four. Jordan Hollett made 25 saves for his 11th win in his 12th start and the Pats improved to 39-6-6-1 on the season. - Nick Henry has scored a goal in five consecutive games. - Connor Hobbs scored his eighth powerplay goal of the season in the win. - The Pats clinched a playoff spot with the win, combined with Calgary’s loss to Medicine Hat. Regina will wrap up their three game road trip on Saturday night in Red Deer against the Rebels at 8 p.m. on 620 CKRM. Next home game is Tuesday, February 14 against the Everett Silvertips. Tickets are available at reginapats.com or at the Brandt Centre Box Office. Come into Subway and order a Pats Fresh Value Meal (sandwich, 21 oz. drink and side) and receive a free bronze level ticket to a Pats home game! While supplies last at participating restaurants in Regina. What do the Pats do now for the next month, having clinched already? No use going to anymore games, save up your $ for playoff games folks. Lol. They play tonight in Red Reed?? Yes it will be interesting to see how the Coaches and Players handle this situation. You'd think there may be some lacksidaisical effort in a few upcoming games but we'll see. This is where the coaches earn their keep. I am sure there will be a few of the players (from Top 6F and Top 4D) given a night or two off which will be a bonus come playoff time, not only for those players but for the young guys who will get some added playing time down the stretch. All in all it is looking very good for this Team and The Regiment! Hollett played another solid game and with he and Brown seemingly recovered from their injuries JP and staff must be smiling ear to ear. They have to be the best goaltending duo on any roster in the WHL, and perhaps the CHL?? They'll need them to come up big in the playoffs. The remaining games against the Warriors will be playoff atmosphere and can't see these two teams not meeting the East Final. I feel they are far and away the top teams in the East and would be a shame for one of them to lose out early. Can't wait for Tuesday to lay a lickin' on a US-based team! Ummmm... they cliched a playoff SPOT, not first place. Still plenty to play for yet. Another impressive win, the next on the to do list is clinch home ice advantage and be playing a solid game heading into the playoffs. The goal is to win the memorial cup. The Pats will most likely meet the Warriors in the second round, unless one of them lose in the first round, not in the East Final. Not to be overly critical, as they are both good goalies, but to say that Brown and Hollett are the best netminding tandem in the Dub, or in the CHL, is a stretch, with respect to Mr. Weppler (who should be commended for his support of the the Pats through good and bad times, and for his often insightful comments). From what I have seen for goalies who have come through so far this season, Moose Jaw and now Speedy Creek, with picking us Papirny from Brandon, have the strongest starting goalies in the Eastern Conference, each of whom are able to steal a game and maybe a series in the playoffs (they may not have a stellar one two punch in net with the Warriors or Broncos, but if there is a hole in the armour so to speak for Regina, it is maybe between the pipes; good but not outstanding would be a fair description of Brown and Hollett (and who I thought actually looked a bit better last year than this year). Regina also plays a touch light, and can get out worked along the boards by bigger more aggressive or physical players). However, it is nice to see Regina finally breaking free of the chains of mediocrity after so many years of an almost circus like situation at times which existed for far too long with the Parker regime. WesternMBRiders - I guess my comment was to the suggestion that if Brown went down for any period of time but Hollett (11W - 1L) was still available then I don't think the Pats would miss a step. Can that be said for either Warriors or Broncos, or any other team in the WHL? Remember Pats were without both of them for a stretch and still only lost a couple of games, so Pats are strong with or without their best in net. Brown has played very well of late and is ahead of Sawchenko and Papirny in GAA and they are pretty well even in save %, while Hollett is ahead of those Teams backups in GAA as well, but only played 12 games so not sure if that means he is better then his stats or worse than his stats show? And yet you say Papirny and Sawchenko are outstanding goalies while Brown is only good? Brown took the Pats to the 7th game of Eastern Semi last year, and the Pats are better offensively for sure and as good defensively this year. Pats scored 3 or less goals in 4 of those playoff games, while losing 3 of those 4 by 1 goal. I think they will score a lot more goals in playoff games this year, based on what I have seen so far. I'll stand by my statement about the duo with the evidence stated above. The only way the pats lose in playoffs is because of goaltending. Neither are bad goalies but neither will steal you a game either. Watch out for Lethbridge as well. Playing very well and score a ton of goals too!! Save the money for playoffs????? Are you kidding me.... you probably saved the money for years not going. This team is so good to watch!! I often forget that it was Brown last year that stood on his head in the playoffs. I feel as tho the Pats also played a different type of game last year. I will be the first to say it, I was wanting them to go out and get a goalie at the deadline. Soon after the deadline I find out that Brown was playing hurt....who knows how long because of Hollett already down. They finally decide to sit him for a bit and now that he is back he is playing way better than the start of the season. Good to see him and Hollett back and both playing well. Can't wait to see Tuesday's game as it could be a potential Championship Final preview. I hope we light up Hart for 6. Mr. Mikes here I come. Didn't Lethbridge get utterly destroyed by Med Hat Sat Night?